I recently upgraded my trusty 2 core, 4GB desktop to a Hex core with 16 GB of ram and now I’m ready to start managing a few virtual machines. I’ve tried using VirtualBox in the past, but never got the hang of it. I’ve been using VMware Player for a couple of years and love the way it integrates with Ubuntu, especially being able to cut and paste from one to the other and to drag and drop files. Sweet. I was surprised that it took me a few searches before I was even able to find how to download the software bundle. 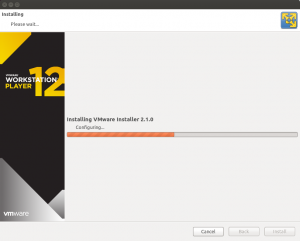 I guess they stopped calling it VMware Player and now call it VMware Workstation Player. Whodda thunk? Anyway, I have it now, so let’s get it installed. Download the bundle from VMware using the link here. Make sure you download the player for Linux 64-bit. Before you can run the installation, you need to set the executable permissions on the file. Move to the folder you downloaded the file into. For this example, I downloaded to my ‘Software’ folder. With the execute permissions set, it’s time to install the program. Since you must be ‘root’ to install the program, we’ll use the ‘sudo’ command to execute it. By pressing the Tab key, the remaining part of the file name should auto-complete. If it does not, you will need to type in the full name of the file manually. Once the VMware Player Installer wizard opens, read the End User License Agreement, accept the terms and conditions and click Next. Select if you would like to check for product updates on startup of the program and click Next. Select if you would like to provide VMware with anonymous system data and click Next. Leave the license key field blank and click Next. Once the installation completes, the wizard will display ‘Installation was successful’. Click Close. To run the program from Unity, press the ‘Super’ key (usually looks like a Microsoft Windows Logo) on your keyboard. Now type ‘vmware’ in the search box. Ubuntu will display the VMware Player icon. Click the icon to get started. I use this program a lot, so I recommend dragging the icon to the Launcher panel for easy access. As a condition to use Workstation Player for free (non-commercial) use, you must enter your email address and click OK.
That’s all there is! You can now create and run Virtual Machines on your computer without having to shutdown or restart. By admin on December 10, 2016 | VMware Player | A comment?